Thanks once again Saint Expedite!!! Thank you Saint Expedite for coming through with what I ask for in less than 24 hours. I am very grateful to be working with you. As I promised here is my post thanking you for granting what I asked for in such a short period of time. Seriously, if you've never worked with Saint Expedite, and you need help fast, he is the one to go to! I am repeatedly blessed by his assistance, and I really hope he enjoys his reward of pound cake, red flowers, and red wine as an extra thank you for coming through in 2 days. Thank you Saint Expedite!!! Thank you so much St.Expedite for coming through once again! You are changing my family’s lives! I am so grateful, blessed be! Thank you Saint Expedite for coming through again. You helped me, my significant other and sister. I am grateful!! Thank you, Saint Expedite, for turning this situation around fast! You are truly the master of swift and miraculous solutions! Your well-deserved slice of pound cake & fresh red flowers will be given to you soon, along with my deep gratitude. Thank you St Expedite for helping me during my issue and bringing it a conclusion. I love you forever St Expedite. Yooo st expedite is super fast! I ask him to give me a heafty tax return , help me get a few raises and fix my credit score ! Yoooo if you want to use him be specific , build a relationship with him ! I asked St. Expedite for help with a pressing situation following a nine day novena. At first, I saw no improvement. Then I got a giant, serious message that could not be mistaken. Thank you for any help you provide, St. Expedite. I will update this with specifics soon. assistance with my Workman compensation case. Thank you St. Expedite for your assistance, I know it was you! I want to thank you again publicly for coming through for my daughter - assisting her with passing her finals so that she could march across the stage next week and obtain her four year college degree. We found out today that all of her grades were A's and a B+. I will be making a donation as promised. Dear St. Expedite thank you for presenting my mom with the possibility to get money quickly. Thank you for hearing my petition. I've had a sudden issue recently. I will appeal to Saint Expedite. The thing is I already have an altar in my room with Mary and I'm already burning money candles and success candles on. Can I create an altar for Saint Expedite on my nightstand and face it east as well. my Mary Altar is facing north. Yes I think that's fine; I haven't heard of St. Expedite having a preference which way his altar faces. Saint expedite thank you for your continued blessing's to my many issue's. I am truly grateful for you answering my prayers. I pray that you continue blessing me by answering my prayers. Thank you for all your help!!!! Saint Expedite this was my first time working with you and I say THANK YOU for helping me so fast!!! Thank you St Expedite for getting me my new home. It didn't feel like a fast answer to prayers at the time but looking back I see it really was so fast! Thank you for your kindness. Thank you St Expedite for answering my petition, this is the second time you have helped me. 1) Can someone tell me if I do the saint expedite ritual if I could do the lodestone money drawing spell the same time, same day? 2) Can I use a regular white saucer? I don't have a chinese plate. 4) Am I on the right track? 2) It's not a "Chinese" plate. It's a China plate, as in China Ware. Just a regular white porcelain plate. Once again I have to offer thanks to St Expedite. So quick and so helpful. I love you! I am one of the millions of ppl you performed a miracle for! I am in need of some assistance. I became family with St. Expedite last year when I needed help financially. I did ask him for help and to my astonishment he gave me exactly what I asked for and I definitely gave him the offering right away. I later ask for something else and I didn’t receive it and I didn’t given any offering. Early this year I asked for the same help I asked for last year and once again he gave it to me and more, and I definitely gave him the offering. But I believe something went wrong and I’m trying to rack my brains what that might because since then I lost my job, I’ve had an unblemished driver’s license and now since then I’ve racked up 7 points. I went to court to fight the ticket and I have PROOF of being not guilty and yet the judge sided with the officer and the the list goes on. Again I know at least I believe I know I gave St. Expedite the offerings but perhaps I missed something and omg I can’t remember what that might be or what I did wrong. So with all that said is there something I can do at this stage to make things all right with him for my luck to change? Cause I am devastated, desperate and I don’t know what to do. Welcome to the Lucky Mojo forum! We're happy to have you here. I'm very sorry to hear that you have been struggling. I suggest that what you do first is get a reading. A reader should be able to tell you whether all this bad luck is truly coming from St. Expedite, or if it's coming from another source. Then you can take action from there. In the meantime, you can read more about St. Expedite by scrolling up through this thread (which is why I moved your post over here). You gave some wise advice there, and i thank you. So many times folks go to a saint or a spirit for help, and receive the help, and give a thanks-offering, and think they are now set for life. It is not always so. An enemy may attack. They may have only asked the saint, spirit, angel or even God for one thing, but now they expect that six other things will fall in line. Or their offering, which was for one thing ("Help me pay my rent") may not apply to another ("Help me find a husband"). Or the stars may have formed a bad configuration and they got caught in a cosmic backwash (say, when Saturn crosses their Saturn-afflicted Sun, for instance). Hoodoo is often resorted to when one is in pain or in desperation, but as another wise person once said to me -- "You don't just wash your windows once in your life -- you have to wash them every time they get dirty." When your windows get dirty, you don't say, "Dang, i must have washed them wrong last year" or "Maybe i used the wrong kind of soap last time" -- nope, you just wash them up again. The goal is to have clear and clean windows, not to "never have to wash the windows again." Good luck, and do follow Sister Jean's advice. 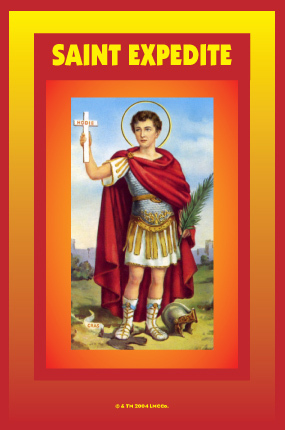 Is it ok for me to post thanks to St Expedite every time he comes through for me? Because once again he has come through for me and I have to thank him publicly! I accidentally broke my saint expedite candle. it fell out of the door of my car when I opened the door. it fell out and shattered everywhere. what does this mean and what should I do now? did I do something wrong? It is not that you did something wrong, its more of a sign to the work. The candle broke before you started, seems to be a sign St. Expedite is not the one for your work. If the candle was for protection like fast quick protection then the candle took the hit for you and broke. Please do not leave broken glass in a field that can hurt animals and children who play in the field. Dispose of broken glass regardless of content properly. Try reevaluating the situation, or the prayer you were going to make and see if Expedite is the best saint for your petition. Pray about it asking a sign if he will work with you and watch and wait for a sign. 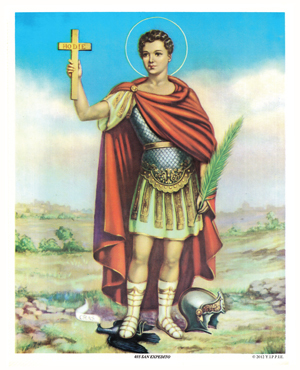 Once again I have come to say thank you to St Expedite. TWICE this week he has helped me in a major way. The most recent I asked him for help with a situation involving other people and had no idea how it would manifest. I asked St Expedite to find a way and he honestly and truly did it. I am in awe. Believe in his ability! I love you St Expedite!! St expedite, I want to thank you for helping me during my desperate need, you worked amazingly fast and I am truly grateful. Thank you St expedite!! God bless you mighty Saint Expedite!! What should I do if st.expedite doesn't work for me? You still must pay the saint with his offering for St. Expedite. I would look into other saints and see if they will work for you, pray to them before working and asking a sign. I needed extra money to move and pow!!! A random gift!! Nobody should go without Saint Expedite!! He answers prayers!! If you dreamed of a Saint it would seem he is reaching out to you. I would pray about it and consider petitioning him ,you must pay him his offering. Thank you Saint Expedite for helping me and hearing my prayer! But also give him some time to work! Hi, I lit several candles for St Expedite asking for help with my financial issues and for finding a steady job. In my petition I specifically asked for money to pay an outstanding invoice. Winning with the lottery for example. Instead of winning the amount of money I asked, an opportunity came on my path -- the possibility to accept land behind my garden. My lawyer said "Do you realise that this is like winning the jackpot?" Now I don’t know if I need to reward St Expedite with the butter cake (I live in Europe and hope that this will be as well as the pound cake) or not. I still don’t have the cash...? But am also happy with the land of course. But I can’t sell this land. Also my job still hasn’t crossed my path. What do you think? Thank you. I would think that what your lawyer told you is right -- getting that land is like hitting the jackpot. They mint money every day, but they aren;t making any more land. I am sure butter cake will do as well as pound cake -- Saint expedite is, after all, from Europe, not America, so what we do here is probably newer than what you do there. Saint Expedite likes flowers, too, so plant a flowering shrub on the land if you can. My advice is to thank him, set more lights, and see where this gets you. Thank you both, for posting about this! I have been deliberating over the same thing for the last couple days. St. Expedite didn't come through in time for the 2 things I asked of him, but the 2 things did eventually come in, just not any faster than if I hadn't petitioned him (as far as I know). It might not have been possible for him to help that situation, though. But I did get some relief from the consequences of the 2 things not coming in, which was actually more of the issue, anyway. And while I was praying and petitioning for those things, I received a random scholarship that I didn't realize I applied for, and that I wasn't really qualified for, either. It will make a huge difference this coming year and it will most definitely save me some petitions to St. Expedite in the future lol. So I wasn't sure about paying him completely for answering my petition.. Not that I'm not grateful, but I just didn't know if this was his work or not, and what would be appropriate. But I'm definitely grateful to every entity that helped me, whether God, spirits, humans, or otherwise, so I will thank him with his pound cake and flowers and declare it as an offering to anyone and everyone who has been helping me. It is very important to always give St. Expedite the offering even if he does not come through. He is known as a Saint to then turn around and take more away if not paid, or to not help in the future. Each saint has different rules to them, some are specific with cake, flowers and how to pay, others are more simple setting a candle flowers and water. I would also consider it a success because it did come through and more. The tradition I was raised with (Roman Catholicism, we're Spanish), considers the Saints to be friendly and loving. While payment is absolutely necessary if they come through, we first of all, don't believe that he would take "more" than what you had to start, if you don't pay him. He would just refuse to work with you again, although I know many other traditions that believe he would take more from you. We also believe that a contract is a contract and he didn't abide by his end of the deal, so payment isn't due. He might have been involved with the other blessings I received but he didn't grant me the things I asked for on my petition. So while grateful for the other blessings, my question had stemmed from the fact that he did not actually come through. The belief that he would take more than what you had to begin with wouldn't apply here anyway since he technically didn't do the job I "hired" him to do. But both mine and your beliefs are both stated on Miss cat's St. Expedite information page. They are both just different traditions and both are valid. If that is your tradition, then you need to abide by it. When petitioning him originally, I had put "if I am granted these things, I will..." because that's the tradition that I follow and that has worked for me in the past. St. Expedite has come through for me numerous times in the past, with the traditions that I keep to. I very much appreciate all the knowledge you have on so many different subject matters, though. Your school of thought is not uncommon. It's just not the deal that St. Expedite and I had worked out. I am an Italian American from New York City Parents raised in Staten Island and Brooklyn, Grandparents from Italy. I am aware of the customs of Saints in Italy. You asked a question, then came back with your own answer to that question, I must ask, why did you ask the question then in the first place if you already knew the answer you wanted? Many of us dedicate time to help people but I dont see the purpose in answering question you already have an answer to! Good luck with your work with the Saint! "It is often said that you must never seek the aid of Expedite unless you are prepared to give this tribute **after the work is done**, or he will take back all the good he did for you, and more besides. This accords with Expedite's position as an analogue to the various African messenger-trickster spirits, and is **not typical of mainstream Catholic teachings about the intercession of saints**". My question wasn't about what to do if he comes through. My question was what would be best if he doesn't. Everything written about him only pertains to when he answers your petition. He didn't answer my petition. So my question was pertaining to what would be best in this case. Even on this thread, other moderators have said that if he doesn't come through, you don't pay. I was happy to see Miss cat's response to Mora because it addressed what she could do in this case. So, I think you just might have misunderstood my original post. I appreciate the time everyone dedicates to this forum, absolutely. My post was a thank you post, to begin with. But even if the help is free, it can do more harm than good if it's not accurate. Again, your school of thought is very common. I've heard it before, many times. But it doesn't apply to this particular situation. I apologize if my posts were unclear. I was only trying to thank the poster and Miss cat for addressing a somewhat unique situation. Your question was what to do if he does not answer your petition. I stated based on how I was taught, which is similar to many other people on the forum including AIRR readers to pay him. I dont find my advise wrong or harmful as many of us believe this based on tradition and experience this is how the saint is. Starr a former member of AIRR and a moderator on LM discusses how St. Expedite can also be used like St. Peter for dark work, even death. I would hardly question Starr on her authenticity of the Saint because it does not fit with how you want saints to be. You then told me not to pay him that is your tradition. This is where the clarity issue is, You answered your own question. You didnt need clarity or a response from anyone in the first place. Best of luck with your work with St. Expedite! My quote was directly from the Lucky Mojo website. It defines both Starr's method, as well as mine. I'm in agreement with you that many work with him that way. I stated that. It's putting words in my mouth to say I'm "questioning Starr" when I'm actually in agreement. The literal opposite of questioning her. The clarity issue was regarding this being a "grey area". He didn't answer my petition. I wasn't questioning that. But he "may" have come through for me in other ways. I'm not sure, though. The black and white answer would be he didn't answer my petition, so I don't pay him. But since I received other blessings, I wasn't sure if I should thank him, along with everyone else I asked along the way. It's possible that he had nothing to do with my other blessings. It's also possible that he did. I mean, I was praying to everyone and everything at the time, being as desperate as I was. So the answer Miss cat gave to a similar situation, was to pay him but keep asking. It's not an exact match to my situation, but I gleaned from it that I would just honor him anyway, but also add in everyone else who might have helped. So no, I didn't answer my own question. There are 3 situations. I knew what to do in 2 of them. This one was the third one that I needed clarification on. Miss cat gave that clarification but still, not quite fitted to my situation, because she wasn't responding to me. So I adjusted it accordingly. Grey areas are just that. They're grey. You have to adjust the answer accordingly to the situation if it doesn't fall under either umbrella. If you feel you need a reading to clarify this situation you can reach out to an AIRR worker who would be glad to do a short quick reading or even a 30 min reading. You can also further discuss this topic of St. Expedite and the "grey" area you have identified. Many of the AIRR members are knowledgable and would love to assist you with your specific petition question and how to continue with the work. Here is a link to AIRR to assist you with that endeavor. I offer you red rosés and butter cake. Once again I come back to thank St Expedite for coming through for me. He may not come through exactly the way you petition him to but he does come through with the result you wanted, which confirms what I learned before I started to work with him: be clear on how you petition him, and even then the results may not cone exactly how you expected but they will come. I love you St Expedite!!! Today was a great example of how St Expedite will answer your petition but not how you might think he will. I was running late for work. I asked him to somehow get me there on time. I arrived 20 minutes late BUT there was a fault in the sign in system which meant it couldn’t verify what time I signed in. They assumed I got there on time and I’m not gonna correct them lol. Glory to you St Expedite! That's so incredibly awesome! Seriously! I love coming on here and reading the testimonies from people who do similar work as myself because when things aren't going very well, a testimony like this will pop back into my head at the most perfect times and it'll push me to seek help and to have faith that unexplainable things can happen. A couple years ago, I had a similar experience. I desperately needed to hear back from a professor regarding a meeting time to discuss options to change a grade I had just received. I needed the grade changed within 2 days in order to be allowed back into the nuclear engineering program so it was a long shot as it was. He was also on vacation at the time and I didn't know if he was even allowed to change the grade, let alone if he would agree to it and if any of it would be in time. Nuclear physics isn't the type of subject matter that the faculty feels comfortable saying, "you tried your hardest so we'll just give you the C" lol. Well, I lit the candle, left for the day, and about an hour later, I received an email from my advisor saying they talked with the registrar and they'll allow me back into the program with a save based on a technicality that not even my advisor knew about before that day. So, he didn't bring me the communication from the professor like I had asked. It would've taken too long to get the outcome I was ultimately wanting. He just cut to the chase and brought me what I wanted, without any middle men or red tape lol. It's really incredible how the entire earth seems to move in order to give us the things we need. And even for the less dramatic things like running late. So, thank you for posting about that! It really helps to hear these things.